Part Number 6723. This heavy-duty, stainless-steel floor stand includes a door, shelf, latch, and lockable casters. 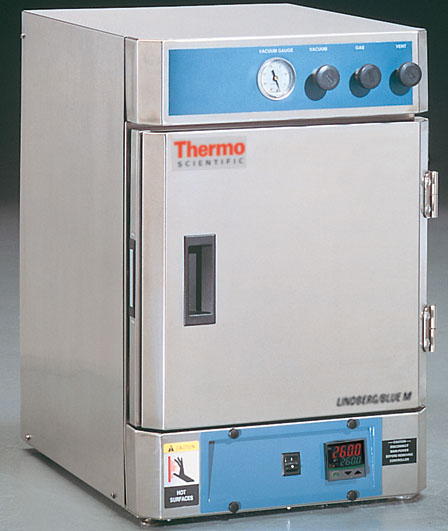 It measures 28.2"H x 27.5"W x 30"D. It is specifically designed to work with all Lindberg/Blue M vacuum ovens (VO914, VO1218, VO1824 series). Part Number 305993H01. Includes (1) silicone gasket (red) for use with VO1824A, VO1824C, VO1824SA, VO1824HPC Lindberg/Blue M vacuum ovens. Part Number 34637H01. Includes (1) Buna-N silicone-free gasket for use with VO1824A, VO1824C, VO1824SA, VO1824HPC Lindberg/Blue M vacuum ovens. For temperatures up to 150C only.